Augustus, Unearthed Luxury Candle Review - The Candleberry Co. Okay candle lovers… did you know Candleberry has a new luxury line of scented candles they just released to the world? Oh yes, and this lucky girl… ME… gets to review a few for Candlefind. When I say lucky, I mean it. The candles I received are downright gorgeous and so incredibly fragrant, I was a little blown away. The name of this new line from Candleberry is called Unearthed and there are seven decadent fragrances to choose from. The size and style candle depends on the scent you choose which can easily be viewed from their Unearthed website. Once there, they show each candle and fragrance with vivid pictures and descriptions for your viewing pleasure. Augustus will be the first candle I’m reviewing because it came in the most prestigious box I have ever seen. As with any luxury brand, presentation was beyond amazing and in my opinion… important. If I’m going to spend some serious cash on a candle, I expect to be blown away in every way imaginable and presentation and packaging is big part of that. The box! I must tell you about the box. It was (I’m guessing) 6 X 5 in size and sturdy with beautiful embossed leaves on the entire surface of each side. The top of the box had a huge filigree bronze emblem in the center of a huge circle. I’m not going to bore you with all the verbiage on the box but suffice it to say… it was very detailed and elegant. 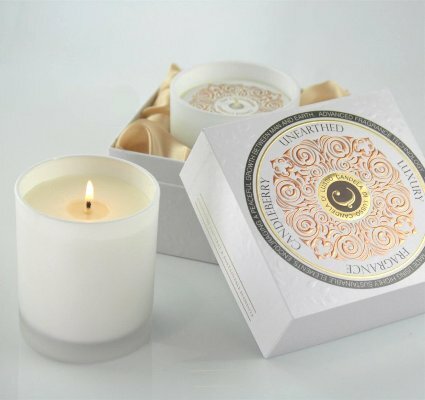 Once you open the lid, a beautiful white frosted luxury candle is securely placed and centered around a golden satin base. Also inside the box was a little box of matches and a lovely card giving you a little history and background on the fragrance. Augustus Caesar, “The First Citizen”, the founder of the Roman Principate and first ruler of the Roman Empire, is one of the most powerful and popular leaders in all of history. It was during his reign, as Roman Emperor, that Jesus, the Messiah, was born. Augustus, the fragrance, celebrates boldness, power and the antiquity of the story. It is a powerfully classic symphony of fragrance true to masculine. Description: Oak wood, brushed suede, vetiver and patchouli with bright notes of Bergamot carried by warm tobacco and amber. Wow! That’s some description and sounds very complex. After smelling the candle, I admit… it was very complex! The overall fragrance smelled very exotic and earthy with the mid and base notes jumping out at me the most. Suede, worn leather, oak wood, tobacco and vetiver were really predominant and boy was it strong! I had this candle sitting next to me as I typed this intro and the fragrance wafting from the candle literally surrounded me as I typed. So far, I’m very impressed! I decided to be bold and light this candle in my master bedroom to start out. I had a feeling this candle would pack a punch and oh my goodness did it ever! Once the wick was lit, it took a good 5 hours to reach a full melt pool, but the fragrance was present long before that and it smelled just as it did cold… a very complex scent of suede, leather, tobacco and vetiver. I’m sure everything else in the scent description was present as well but I had a hard time distinguishing each individual one. To me, leather, suede, tobacco, vetiver and oak dominated the most and boy was it dense and strong. My picky husband even put his two cents in and said it smelled like perfume more than anything else. I could see why he made that distinction, it did have a perfume vibe to it. Also want to point out, I had this candle burning a full week and he never once asked me to extinguish it so that speaks a lot to me. It may have smelled like perfume to him, but it wasn’t offensive. To me, I attribute that to the quality of the fragrances used. Good job Candleberry! Strength – On a scale of 1 to 10, I would rate this candle a 10 in any size room. This candle not only filled my huge bedroom with fragrance, it traveled into my open bathroom and even spilled out into my great room. That’s pretty potent. This candle burned perfect. It was very slow burning but did reach a full melt pool with each lighting… it just took hours to do so. Once it did… perfection. Clean burning from start to finish. No wick issues. No soot. Augustus was a beautiful candle and definitely had a luxury feel in both style and fragrance. And the box it came in… wow! What a great gift it would make to someone you love for any occasion. In the end, I’m glad I tried it. Augustus was a scent I normally wouldn’t gravitate towards, but that’s the beauty of luxury candles isn’t it? They aren’t everyday fragrances and shouldn’t be. They should pull you out of your comfort zone and take you on a journey. Where that might lead, you never know. I think Candleberry pulled it off. I’m intrigued and looking forward to my next experience into the world of “Unearthed” luxury candles. I also can’t end this review without mentioning their prices. This Lusso candle was $38.00. That’s super reasonable considering the size and how long it lasted. I easily burned this candle well over a week and that was burning it all day, every day. Can you imagine how long their larger jars will last? Browsing their site a bit more, they have 68oz candles in their Magna Vitrum line. 68 OUNCES! Now that’s a table setter. I want!! I repeat… I want! Oh yes, I am intrigued indeed. Stay tuned… one more review to come. The scent… Confectio. Does that not sound wonderful and maybe even edible? Visit Unearthed from The Candleberry Co.
Love luxury candles? Read more reviews here. Augustus - Unearthed, The Candleberry Co.